Ever had a pluot? They’re a hybrid between a plum and an apricot. 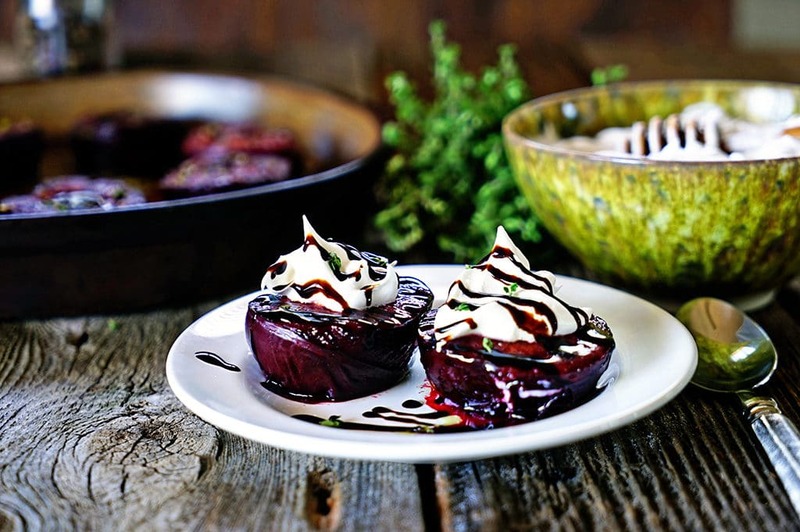 Well let me show you how this Honey Roasted Pluots with Mascarpone Creme can be a new dessert. 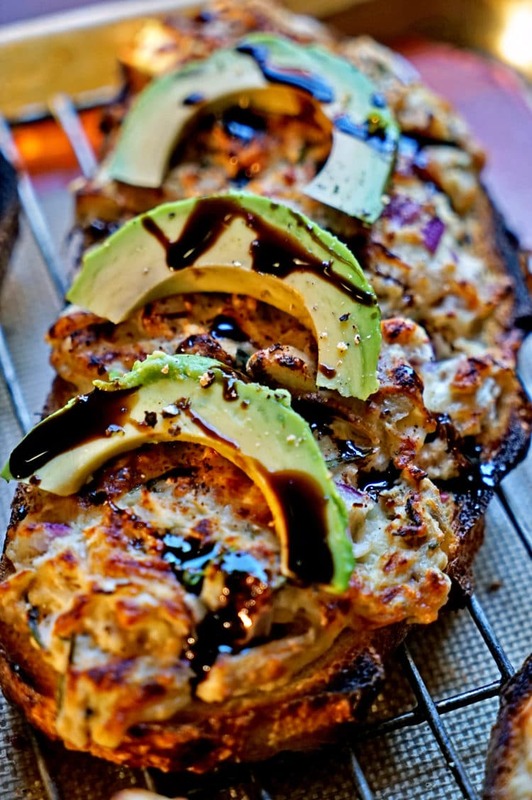 Balsamic syrup gets drizzled on top and wow, this is a good one! If you haven’t tried a pluot, ask your grocer, or keep an eye open at the local Farmers Market. The lady selling them to me at our local market said they may also go by their other name Apriums, but Pluots seem to be the main name that has stuck. It definitely has a higher sugar content than either fruit separately and I thought of a friend’s recent recipe post, which inspired me. 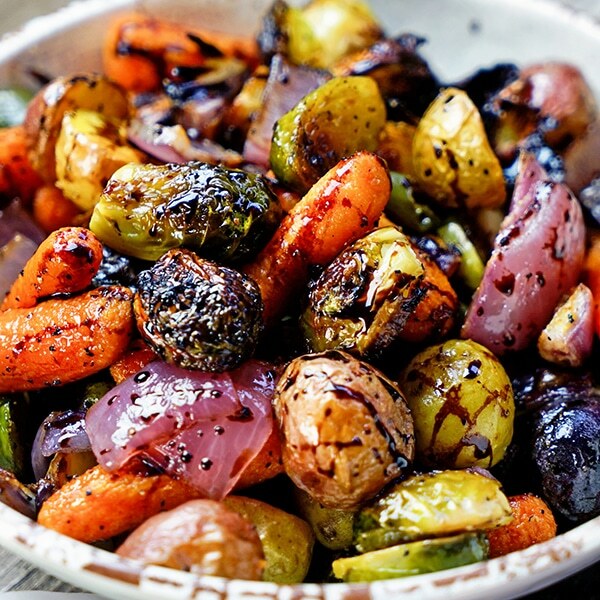 I decided they would be perfect to roast with honey, a drizzle of olive oil, and some delicate thyme leaves. Thyme is one of my favorite herbs and I love the play herbs and fruit have like in my Blueberry, Strawberry, Goat Cheese and Basil Tart. 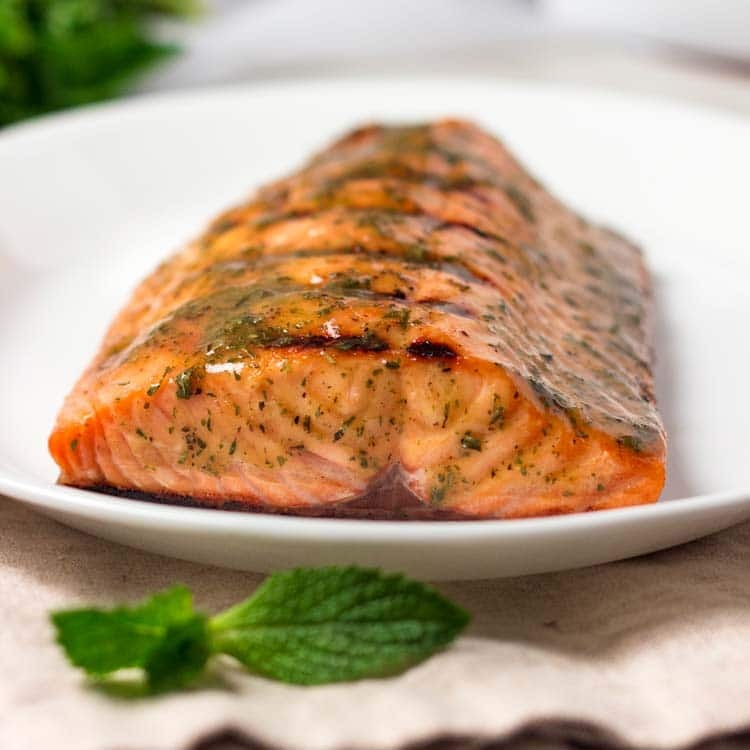 Such a subtle, unexpected flavor combination and it is always welcomed and the thyme works beautifully here. 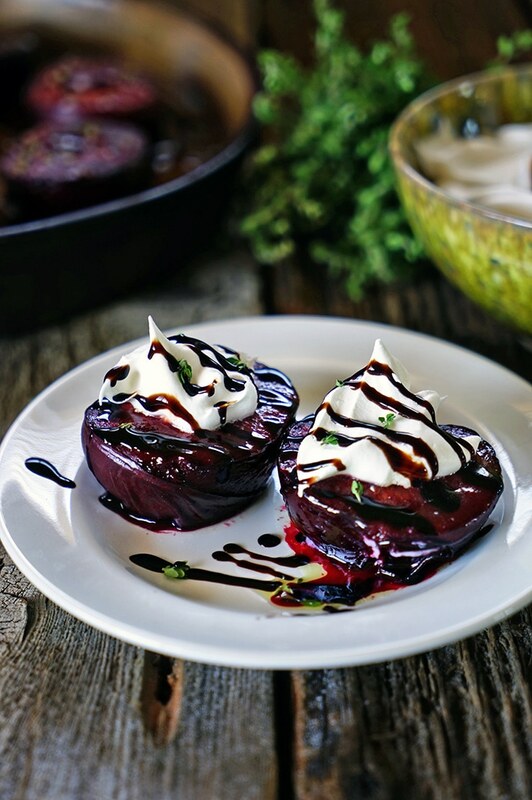 To add another level of flavor I decided to drizzle balsamic syrup over the pluots after roasting and anoint each with a healthy dollop of mascarpone cream. 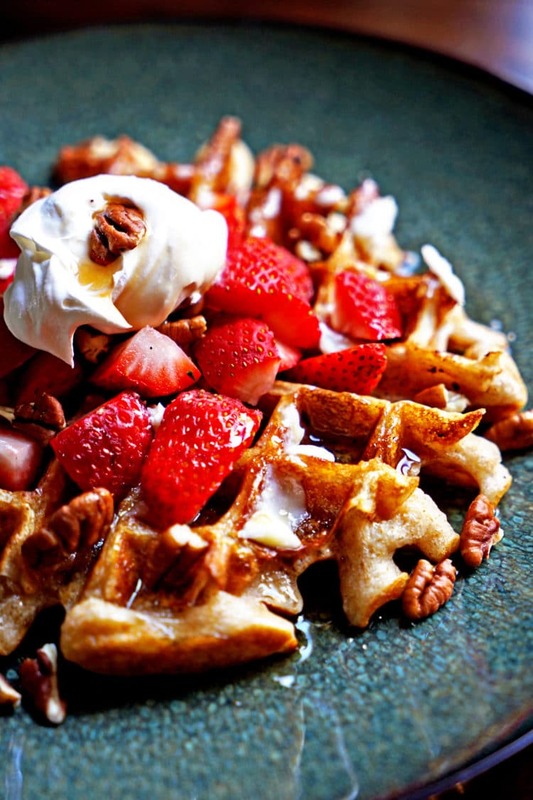 I first introduced this wonderful combination of mascarpone cheese and whipped cream for my Whole Wheat Sourdough Waffles with Mascarpone Whipped Cream and Fruit and since it’s so quick to make, this dessert was ready in no time. Preheat oven to 400°F. Slice the pluots in half and remove the pits, discard. To make the topping place mascarpone cheese, heavy cream, sugar and vanilla in a medium bowl and beat with an electric mixer until cream is thick and smooth. Cover and refrigerate until ready to use. 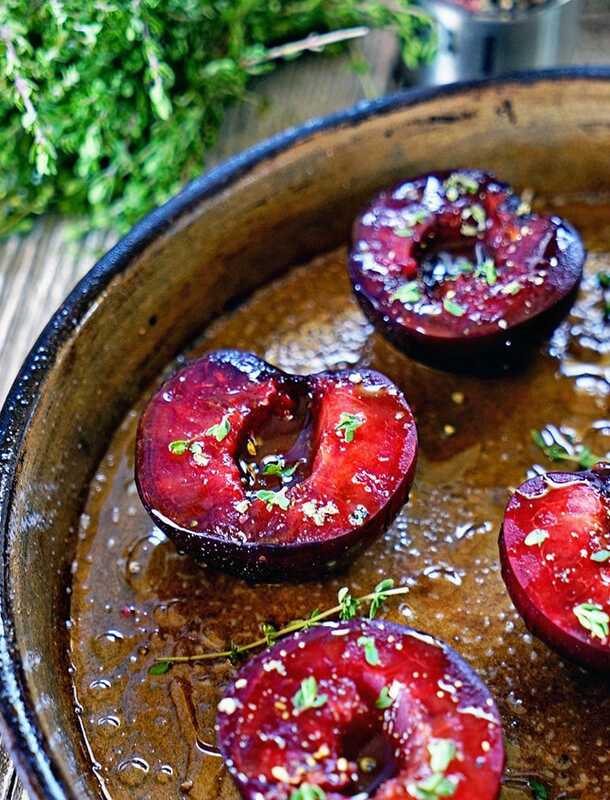 Place pluots on a lined baking sheet or stone and drizzle with olive oil and honey. 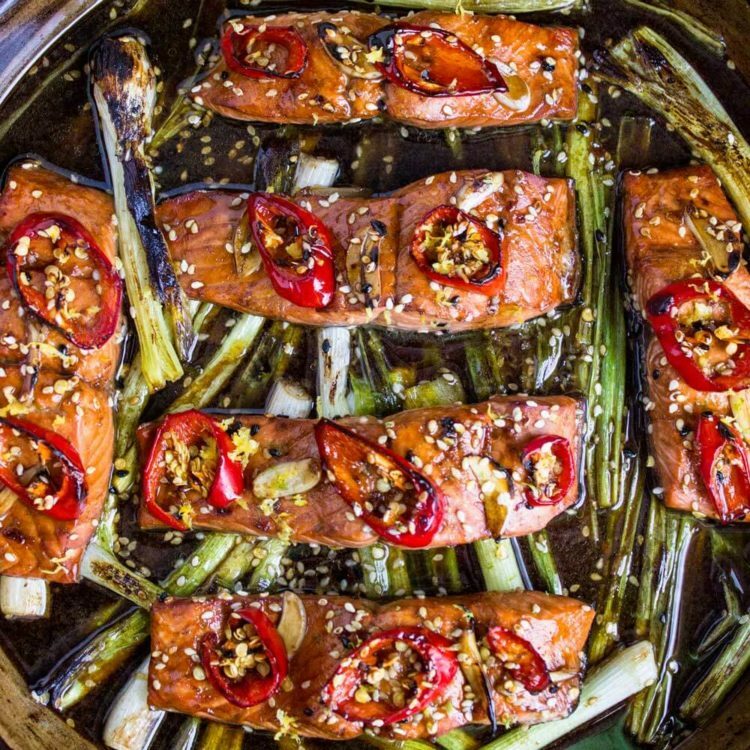 Sprinkle fresh thyme leaves on top and roast for 12 minutes. Tops should start to caramelize. Remove from oven and allow to cool. 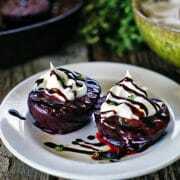 Top with whipped cream or Mascarpone Cream and a drizzle of balsamic syrup. Pretty easy peasy to make, right? Enjoy! 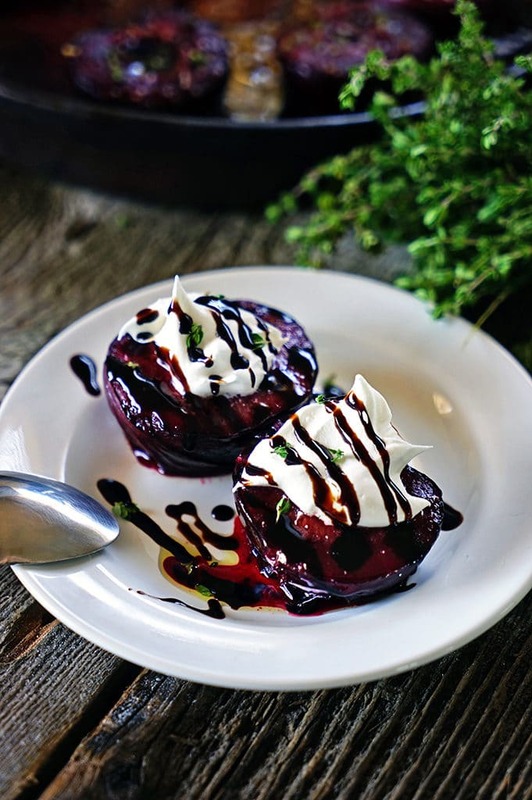 Honey Roasted Pluots gets a drizzle of olive oil and honey, is roasted and caramelized then served with mascarpone creme and a drizzle of balsamic syrup. Preheat oven to 400°F. Slice the pluots in half and remove the pits, discard. To make the topping place mascarpone cheese, heavy cream, sugar and vanilla in a medium bowl and beat with an electric mixer until cream is thick and smooth. Cover and refrigerate until ready to use. Apriums or Pluots? Never heard. I only now black apricots, and they must be the close relatives of these guys. And what a dessert, Kevin, eh?! 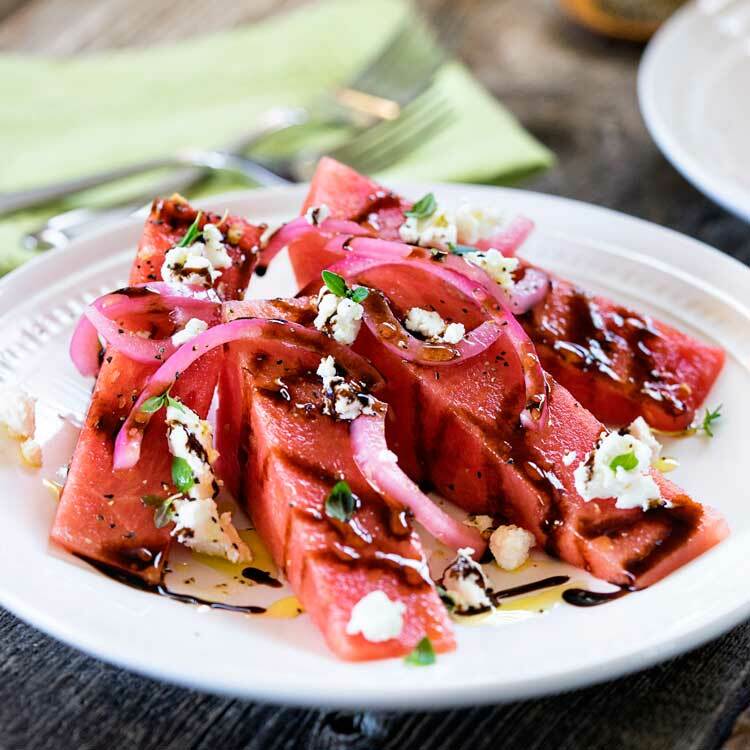 Luscious fruit drizzled with honey and sprinkled with thyme. And with mascarpone, it’s divine (Not that skinny, though) 🙂 Well done! Definitely roast those bad boys and let me know what you think. Have a great weekend Chey! See even in the country where you live now you can get hybrid fruit, so cool! Thanks so much Kennedy! I would easily substitute peaches, plums or apricots. It’s so easy and looks like you spent a lot of time on it. Thanks for Pinning, too! That first picture actually made me say ‘mmmm’ out loud. 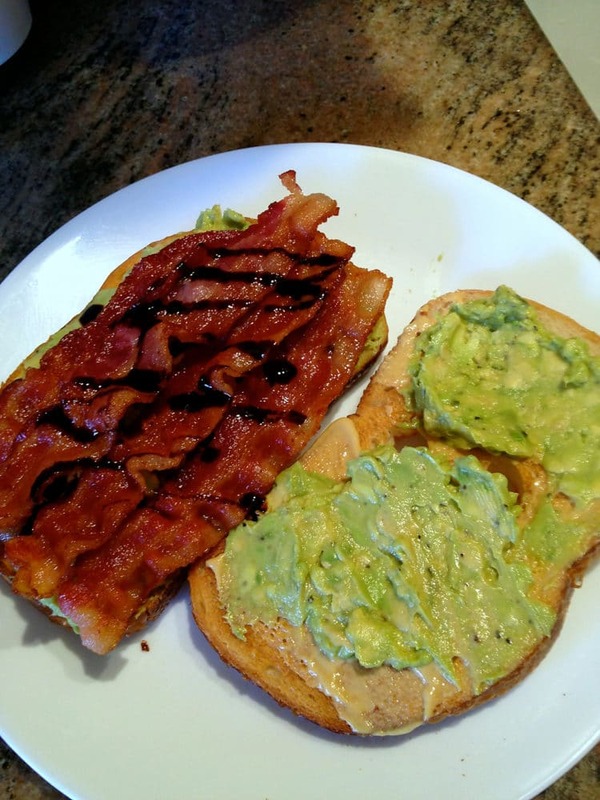 My husband came over to look over my shoulder and said, ‘Are you going to make that?” Of course the answer is yes! 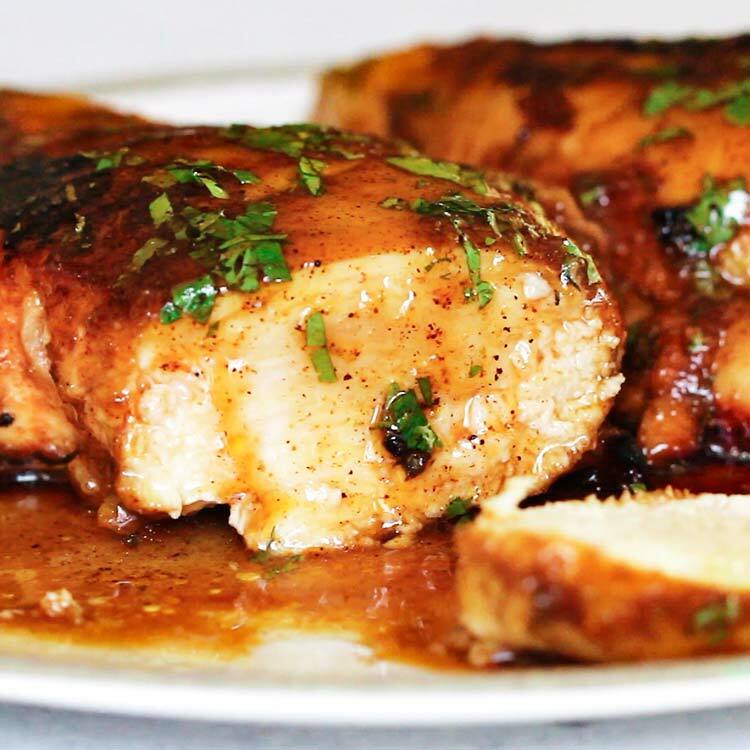 You have such a great way with BIG flavors – savory or sweet. Now that’s the kind of Comment I love to read first thing in the morning! Thanks Marissa, you’ve got my day off to an awesome start and I hope you enjoy them. I adore hybrid fruits!! Tangellos is my winter fave 🙂 Pluots look cool! I can imagine the flavour. And wow, what a way to prepare them! Pinning! Hey Kevin! I hadn’t heard of or seen pluots. They look so juicy and delicious! If I can’t find them (which would not surprise me) I can get nice plums and try this – not quite thee same, but close! I cannot believe this! I just recently had my very first pluot in the form of a pluot gallette with lavender sweet cream…it was divinity! So, I know how spectacular a pluot can be. But that mascarpone cream as a topping – forget about it! Gorgeous – as usual! I bought pluots last year but they were nothing like yours. Mines were yellowish and not sweet at all. Actually they were pretty sour. Not pleasant at all. Thanks for the inspiration here Mike. These pluots were just outstanding in texture and taste. I really loved them cold from the fridge, too. If you get another chance try them out Dave. I could could easily see you whipping up some sort of bread or dessert with them. Hmmm, maybe ice cream?